The IMF have come out today with a report suggesting that Advanced Countries do not end financial stimulus (this is what our Prime Minister is addcited too, remember?) before 2011 for fear of causing a double dip recession. No doubt the bullying left wing cheerleaders will say the Tories are wrong again. Where to start? Well firstly Dominique Strauss-Kahn who is the Frenchman who runs the IMF is a marxist and so will always think state spending is a good idea. Secondly, George Osborne had a good phrase at the start of the crisis "You can't borrow your way out of a borrowing crisis." This is even more truwe today, even with sclerotic growth in the economy, piling up debts on top this shaky foundations is simply not the answer. Thirdly, all this so called stimulus and Government spending is not economically beneficial. Quantitative Easing has been used to boost the bond and equity markets (good for those who foresaw this), which has bailed out the banks but done nothing to increase demand in the real economy. The Government spending on diversity counsellors, bullying hotlines and regional quangos' is of dubious value except to those who collect the paychecks. It would be much easier to scrap the lot of these jobs and then raise unemployment benefit by 80% of the savings made. Finally, a double dip - where is the evidence in the UK that we have even exited recession? The UK is in a far worse position thanks to Labour overspending in the boom than France or Germany. We are simply not in a position to spend more of our children's money so frivolously. So where do we get too? Well a sensible Chancellor would start cutting the fat off the public sector straight away, at least 5% a year for the next Parliament should do it. Quantitative Easing should not be re-started as it only piles up future losses. If the banks need more money they can raise it in the market like they did last year. City, I think you have a couple of points on this wrong. First on a point of fact the IMF's Strauss-Kahn ran a balanced budget and built up a large surplus when he was finance minister in France. He's probably the most responsible finance minister France has had in living memory. ...What you'll see is that the UK isn't "stimulating" the economy, it's doing the opposite, the fiscal stimulus policies have been ended and in fact they're being reversed, eg VAT going up. Gordon Brown and The Treasury have an odd sense of timing. Loose fiscal policy in the past ten years encouraged a boom. Today it's fiscal tightening, almost as if they want to make the boom worse. Pro-cyclical policy at its worse and the IMF must be horrified at the mess that characterises British fiscal policy. i'm puzzled. didnt think this was how the imf were going to react. fully agree about trimming budgets annually, though i think some others have said this neednt lead to immediate lengthening dole queues. "spending on diversity counsellors, bullying hotlines and regional quangos' is of dubious value........It would be much easier to scrap the lot of these jobs and then raise unemployment benefit by 80% of the savings made"
really should be backed up with some numbers dont you think? don't mean to criticise, rather we'd flesh out the debate. Also, we are now more vulnerable to unexpected external shocks than we have been for most periods of our history. Not only are we weakened, we no longer have the apparatus of independent government or reliable information sources to deliver effective decisions. The Fiscal side, we have no stimulus? - just a £178 billion annual deficit. Structural or not is no the issue, that IS stimulus. It is way above what the economy can support. it's just as you say we have had it for so long peope can't see it for what it is anymore. And you ignore the QE - £200 billion injected into the banks and markets. 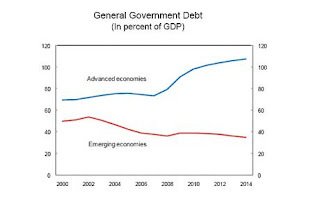 Strauss-Kahn is still a marxist and the IMF have a pure keynesian view of the world. I happen to think they will come in and run the UK economy if our politico's carry on as they are and will do a better job - not becuase they are good, but becuase all things are relative. We are left with pro-cyclical behaviour for this recession. a terrible fate - but one we experienced in the early 80's too after the last labour government. ROYM - You are right to ask for me to elaborate and at some point I will try too - problem is the Government don't publish such stats for us to analyse. Quango's cost £4 billion a year, so we could start there. Scrapping 66% of them should be easy. Demetrius - Quite right, the Government are going to let the Pound take the strain for any external shocks. Hope your savings and investments are based on a basket of currencies and gold. We don't need to boost demand, To get the economy to recover we must let supply adjust to real demand. That means getting rid of things that are not in demand, such as extortion funded 5 a day real nappy diversity consultants funded by transfers from the mutual reciprocation sector. The Conservatives 'claim' that they will have a budget in 50 or so days. They have a hope. It's doing to take nearly a year to do a forensic audit of the fiscal position of the country and formulate a plan. Probably liquidation. I rather thaought that the interesting half of the graph was not the developed countries but the emerging countries. Does this explain the IMF's reluctance to see this end? The IMF isn't independent so this was a put up job with the Government's approval. Overall I agree with you CUS. If the spending was about shoring up the roof and stabilising the foundations, you and I would be on stickier ground but as a large chunk of public money is wasted via inefficient purchasing methodologies and pointless fripperies like equality officers, carbon offset payments and other such nonsense. Your blog is really nice. If I may share some insight, traffic studies on blogs show most people read blogs on Mondays. So it should encourage blogger to write new updates over the weekend primarily.